Why Is an Anti-Abortion Measure on the Ballot in America’s Most Pro-Choice State? We answer that, and 10 other urgent questions about November’s election. Autumn arrives in Portland the same way every even-numbered year. Rain pours. Gutters clog. And yard signs spring up from the earth. Election season is here. And it's a spooky time. And in four weeks, ballots will start arriving in voters' mailboxes. We don't blame Portlanders for eyeing those ballots as if baby spiders were about to spill out of the envelope. That's because this year, Oregonians took full advantage of the state's initiative system—in which anyone can put almost anything on the ballot if they get enough signatures. The November election includes an unusually broad range of ballot measures. Some of them—like the ones restricting abortion and cracking down on immigrants—feel like an early chapter of The Handmaid's Tale. Isn't this supposed to be a blue state? What's going on here? It's time for some answers. Our newsroom spent the past month poring over the November ballot, identifying the 11 questions that most puzzled us. We've tried to address them by talking to the key players in this election cycle, seeking to understand their tactics and their goals. We wondered who paid for the attacks on Gov. 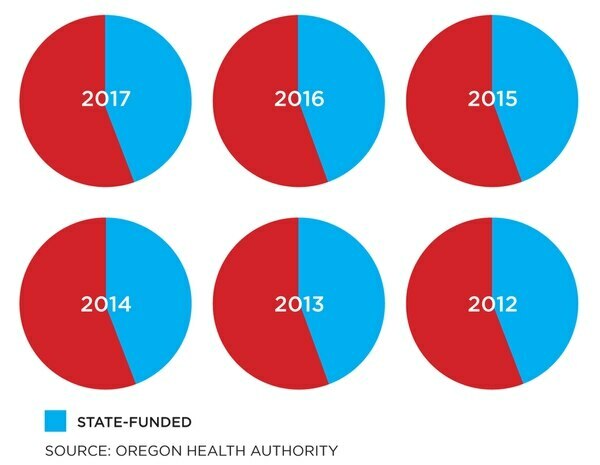 Kate Brown; why an anti-abortion measure is on the ballot in arguably the most pro-choice state in the nation; and which elected official not on the ballot has the most at stake. This isn't an endorsement issue—those choices will be revealed next month. Instead, it's a primer on the issues that Oregonians face this November. As your teachers used to say each fall when you went back to school: We aren't telling you what to think. This is a discussion about how to think about the underlying issues. And this year's ballot has a lot to ponder. AARON MESH. 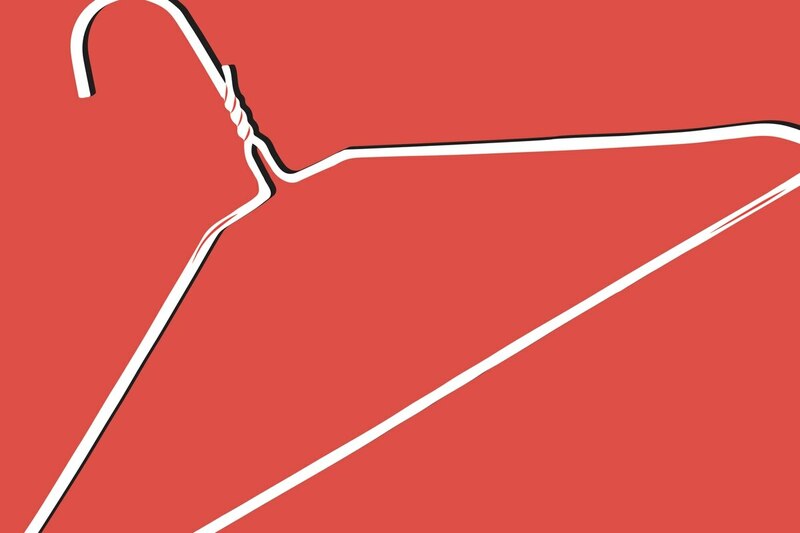 First: Why is an anti-abortion measure on the ballot in America's most pro-choice state? Oregon is the only state in the country that has not passed any restrictions on abortion access since Roe v. Wade was decided in 1973. Not only does the state not restrict abortions, but it pays for them with public dollars. But this fall, for the first time in 12 years, Oregon voters will be asked to decide whether to restrict women's access to taxpayer-funded abortion. Measure 106 would bar spending state funds to provide abortions for low-income women; it would also cut off insurance coverage of abortions for women employed by state government. Cutting off that funding may be only a partial restriction—but it comes at a moment when abortion rights in this nation feel vulnerable. And given that 40 percent of the 8,506 abortions performed each year in Oregon are government-funded, or funded by the health insurance of state public employees, the measure would be a significant victory for the pro-life movement. With Trump nominee Brett Kavanaugh potentially days away from confirmation to the U.S. Supreme Court, the federal bench could soon flip and open the door to a reversal of Roe v. Wade. Voters in other states will be deciding the fate of more drastic attacks on abortion rights this November. West Virginia and Alabama both have measures that would amend their state constitutions to explicitly declare abortion rights are not protected. Oregon's smaller step is part of the larger, four-decade-plus strategy on the part of the pro-life movement to chip away at abortion access. In some states incremental changes to state laws have systematically shut down abortion providers. Kentucky is on the verge of becoming the first state to have no abortion providers at all. It would be the completion of a quest that began in 1980, when Kentucky banned taxpayer-funded abortions. 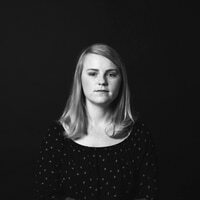 "[Measure 106] is a back-door ban on abortion and it makes it so that only those who can afford it will have access to it," says Emily McLain, executive director of Planned Parenthood Advocates of Oregon. "There's a risk that there could be other restrictions in the future." Oregon Life United gathered the necessary 117,578 signatures to get Measure 106 on the ballot, through an act of political jujitsu: They co-opted and flipped the battle cry of the pro-choice movement. Their slogan? "My money, my choice." Supporters of the measure say it is not a restriction on abortion access, but a choice about where to spend state money. "Is that really a function of government and your tax dollars?" asks state Rep. Julie Parrish (R-West Linn). "There's a lot of people out there who are, like, 'It is your choice, but it's also my choice whether or not I'm going to pay.'" Numbers show abortion in Oregon exists as most moderates say it should: It's safe, legal and rare. Yet it's not hard to see why conservatives are eager to pass Measure 106. A significant percentage of the few abortions performed in this state are government-funded. If abortion foes can cut off that funding, they'll gain a significant victory. KS. 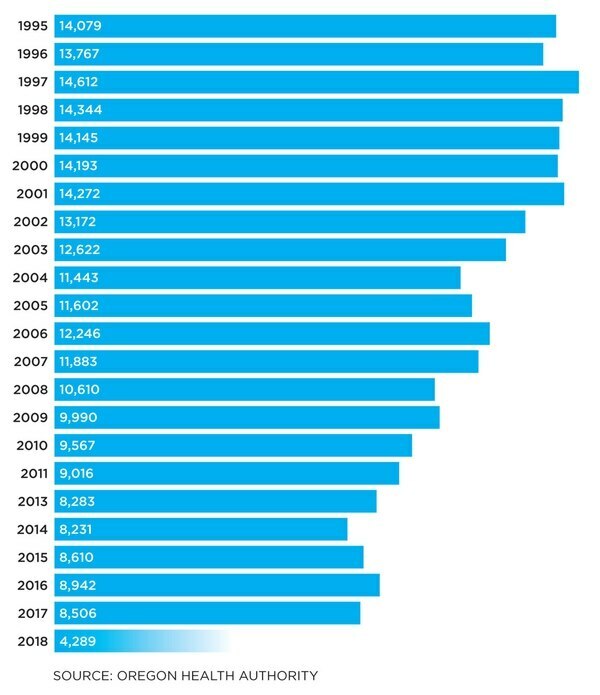 Abortions have steadily declined in Oregon for the past two decades. A significant percentage of those abortions are state-funded.